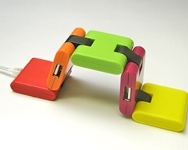 Folding USB Hub can be combined into foldable quadrangular shape and equipped with four ports, two each of the right and left side of the port. Each body part size is of 40X40X11millimeter and weights about 65 grams. 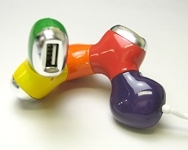 While the doughnut shaped USB Hub, each one by one can be rotated 180 degrees and can be used in irregular shapes. 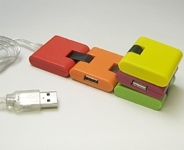 It is a four ports board consisting of five colours, green/yellow/orange/red and purple. The body size of doughnut is about 82 millimeter in diameter and weights 50 grams. 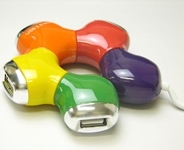 This is a good reason to get a 4 multi ports for wide selection of colours and into various foldable and irregular shapes each time. This entry was posted on Monday, March 24th, 2008 at 5:36 pm	and is filed under Interesting Stuff. You can leave a response, or trackback from your own site.